Pensacola, Fla. (Dec 27, 2017) - Visit Pensacola, Escambia County’s Destination Management Organization, announced earlier this year that the city is slated as an official host port for the Tall Ships Challenge Gulf Coast 2018. This is the first time in history Tall Ships America will brings its TALL SHIPS CHALLENGE® Series of Tall Ships® races and port festivals to the Gulf of Mexico. “As a coastal city with over 450 years of marine and military history, Pensacola is a seamless choice to host an event of this size and caliber. We are excited to see the impact to the hospitality and tourism industry from this strategically planned event,” Visit Pensacola Steve Hayes expressed. “April in the Pensacola Bay Area boasts mild temperatures, active wildlife and endless sunshine perfect for a Spring getaway. With sugar-white sand to relax on and a thriving downtown to immerse in, Travelers will be treated to spectacular sunsets, fresh Gulf seafood, water front dining at award-winning restaurants and leisurely strolls down one of America’s top streets. The Pensacola Tall Ships Challenge Gulf Coast 2018 will take place in Plaza de Luna in Downtown Pensacola April 12-15, 2018. The grand event will occupy three-complete festival days, which will include educational and special tours, onboard tours, sail away ventures, VIP viewing parties, and private ship receptions. Elyssa will be returning to Pensacola after 132 years on a voyage she last completed in 1886 from Galveston, Texas. Elissa is a three-masted, iron-hulled sailing ship built in 1877 in Aberdeen, Scotland. She carries nineteen sails covering over one-quarter of an acre in surface area. From her stern to the tip of her jibboom she measures 205 feet. Her height is 99 feet, 9 inches at the main mast and she displaces about 620 tons at her current ballast. The SSV Oliver Hazard Perry is the largest civilian Sailing School Vessel in the United States. Named after the Rhode Island naval hero of the War of 1812, the ship measures 200 feet from bow to stern and is 13-and-a-half stories tall. 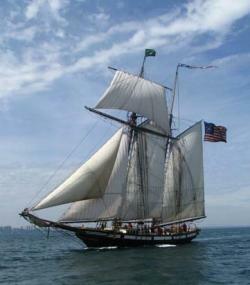 The Oliver Hazard Perry is the first ocean-going full-rigged ship to be built in the United States in over 100 years. The three-masted topsail schooner ‘Oosterschelde,’ is the last remaining representative of the large fleet of schooners that sailed under the Dutch flag at the beginning of the 20th century. As the largest restored Dutch sailing ship, the ‘Oosterschelde’ is a monument for Dutch shipbuilding and maritime navigation under sail. Its maiden voyage took place in 1918 and measures 40,12 meters from stem to stern. The Picton Castle was built in 1928 as a Swansea fishing trawler, operating out of Wales. At the start of World War II, she was conscripted into the Royal Navy and became the HMS Picton Castle, a minesweeper. After the war she eventually began hauling freight, working in the North and Baltic Seas. She underwent a name change and for a while was known as the Dolmar. In 1996, she was taken to Lunenburg in Nova Scotia, Canada, to begin a two-million-dollar refit. Measuring 179 feet, she now serves as a training vessel operating around the world. For more information on Spring travel to the Pensacola Bay Area and the Pensacola Tall Ships Challenge Gulf Coast 2018, visit www.visitpensacola.com. Founded in 1973, Tall Ships America is a non-profit organization dedicated to enriching youth education through character building and leadership programs aboard tall ships. It is the hub for tall ship activity, expertise, and information in North America, and is commended by the United States Congress as the Sail Training Organization representing the United States in the international forum. Tall Ships America supports the people, ships and programs of sail training and tall ships through grants, scholarships, conferences, education, publications, regulatory and licensing information, public events and advocacy. The mission of Tall Ships America is to encourage character building through sail training, promote sail training to the North American public, and support education under sail.